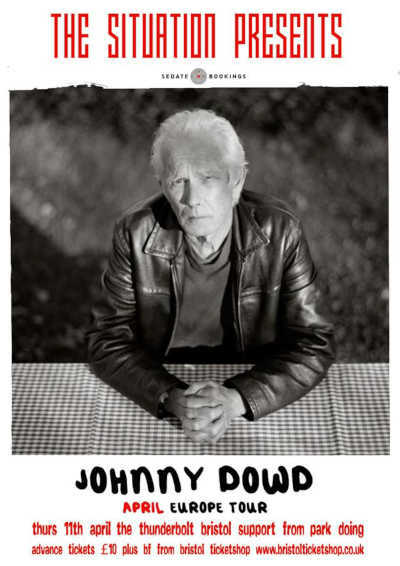 “Thirty years on from his remarkable, indescribably dark and damn right startling Americana debut “Wrong Side Of Memphis”, Ithaca, NY, legend Johnny Dowd returns to the roots rock arena with Family Picnic, his new album set for release on March 1st. THE JESUS BOLT: Gerard Starkie ( Ex Witness and Blue Aeroplanes) has joined forces with Hazel Winter as ‘The Jesus Bolt'. The band was initially masterminded to promote the release of Hazel’s book of poetry ’I’m Scared Of The Pig On The City Farm‘ (due for release summer 2018). It has now rapidly transmogrified into a Proper Thing with songs and films and stuff. DJ CACTUS COUNTY: Cactus County plays an eclectic selection of new & classic alternative music from Cardiacs to Hank Williams. He’ll almost certainly play something you’ll want to download the next day. You may be left either utterly disappointed, vaguely bewildered, and/or slightly amused but then again, that’s a bit like life isn’t it.